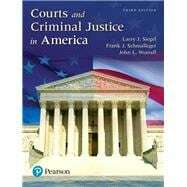 by Siegel, Larry J; Schmalleger, Frank; Worrall, John L.
Courts and Criminal Justice in America, Third Edition, is the collaboration of the most popular criminal justice authors of the century. Featuring a balanced and modern presentation, this book not only looks at the basic structure of the court system and court process, but also covers cutting-edge topics and all sides of the most controversial issues facing courts today. This student-friendly text does not presuppose any knowledge about the courts or how they operate. Highlighted controversial cases illustrate the tremendous power that the court system has to regulate citizens' lives, to shape what is acceptable and what is forbidden, and to ensure that criminal justice policy balances both rights and liberties. Extensively revised throughout, the Third Edition features new and updated statistics, chapter-opening stories, and Courts in the News and What Will You Do? features that challenge readers to think critically and draw their own conclusions. This respected author team delivers the most comprehensive introduction to America's courts, their personnel, and the context in which they operate on the market today. Courts and Criminal Justice in America, Third Edition, is also available via Revel™, an interactive learning environment that enables students to read, practice, and study in one continuous experience. Larry J. Siegel was born in the Bronx and graduated from Christopher Columbus High School in 1964. After attending City College of New York in the 1960s, he pursued his interest in social forces and human behavior when he became a member of the first class of the newly created graduate program in criminal justice at the State University of New York at Albany. After earning his M.A. and Ph.D., Dr. Siegel began his teaching career at Northeastern University; he also held teaching positions at the University of Nebraska, Omaha, and Saint Anselm College in New Hampshire. He currently is a professor emeritus at the School of Criminology and Justice Studies at the University of Massachusetts, Lowell where he had taught for 27 years. Professor Siegel has published books on juvenile law, delinquency, criminology, and criminal procedure. The father of four, grandfather of three, Larry and his wife, Terry, reside in Naples, Florida, with their two cockapoos, Watson and Cody. Frank Schmalleger is Distinguished Professor Emeritus at the University of North Carolina at Pembroke. He holds degrees from the University of Notre Dame and The Ohio State University, having earned both a master’s (1970) and a doctorate (1974) in sociology (with a special emphasis in criminology) from The Ohio State University. From 1976 to 1994, Dr. Schmalleger taught criminology and criminal justice courses at the University of North Carolina at Pembroke; for the last 16 of those years, he chaired the university’s Department of Sociology, Social Work, and Criminal Justice. The university named him Distinguished Professor in 1991. Dr. Schmalleger has taught in the online graduate program of the New School for Social Research, helping to build the world’s first electronic classrooms in support of distance learning through computer telecommunications. As an adjunct professor with Webster University in St. Louis, Missouri, he helped develop the university’s graduate program in security administration and loss prevention and taught courses in that curriculum for more than a decade. An avid Web user and website builder, Professor Schmalleger is also the creator of a number of award-winning websites. Dr. Schmalleger is the author of numerous articles and more than 30 books, including the widely used Criminal Justice Today (Pearson, 2014), Criminal Justice: A Brief Introduction (Pearson 2013), Criminology Today (Pearson, 2014), and Criminal Law Today (Pearsonl, 2013). Professor Schmalleger is the founding editor of the journal Criminal Justice Studies. He has also served as editor for the Prentice Hall series Criminal Justice in the Twenty-First Century and as imprint adviser for Greenwood Publishing Group’s criminal justice reference series. Dr. Schmalleger’s philosophy of both teaching and writing can be summed up in these words: “In order to communicate knowledge, we must first catch, then hold, a person’s interest–be it student, colleague, or policy maker. Our writing, our speaking, and our teaching must be relevant to the problems facing people today, and they must in some way help solve those problems.” Follow the author’s tweets @schmalleger. John L. Worrall is a professor of criminology at the University of Texas at Dallas. A Seattle native, he received a B.A. (with a double major in psychology as well as law and justice) from Central Washington University in 1994. Both his M.A. (criminal justice) and Ph.D. (political science) were received from Washington State University, where he graduated in 1999. From 1999 to 2006, Professor Worrall was a member of the criminal justice faculty at California State University, San Bernardino. He moved to Texas in the fall of 2006. Dr. Worrall has published articles and book chapters on a wide variety of topics ranging from legal issues in policing to community prosecution. He is also the author of several textbooks, including Crime Control in America: What Works? (3rd ed., Pearson, 2015) and Criminal Procedure: From First Contact to Appeal (5th ed., Pearson, 2015). He is also editor of the journal, Police Quarterly. 2. Who Controls the Courts?